Just wanted to give some credit to this campground for those in the group looking for a nice place to stay in the Taos, NM area. $7 a night! Coin operated showers/big clean restrooms. It’s my understanding that showers are hard to come by in this area – so, I didn’t mind that they were coin operated. Right on the river. Campsites have water at each site I believe and a covered picnic table for each site with roof and one wall shelter. Fire pit and one of those stand up bbq things too. Nice tent pads for your tent. Really impressive for only $7. I wanted to be close to the camp host so that I might rest a little easier with leaving my high dollar sleeping bag and Jetboil and whatnot at the campsite – so, I picked a spot close him….unfortunately it was also right next to the bathroom that I occasionally caught a good whiff of. LOL No biggie though. It wasn’t a constant stench. About 15 miles south of Taos. Some amazing scenery just travelling between the campsite and town. I’ve got video that I’ll try to post soon all the way from Taos to the campsite nearly. Thought about you guys on here and that you might like a heads up that this small campsite is really a gem in my book. There are several other sites in the area as well if this one fills up and you don’t mind travelling to the shower if you need it. Thanks for the info. Sounds like a nice little spot. I'll be sure to check it out next July, when I'll be passing through the Taos area. You guys are special! LOL I uploaded a clip of my trip of this campground for you all before any of my other video. When I get the video of the ride from Taos back into camp in the evening up on Youtube - I will post it as well. Here’s that video from near Taos down to the campsite……some really awesome riding. Youtube killed my Eagles soundtrack to my video….LOL – so, there’s no sound, but you’re not missing anything by not hearing the wind noise. I wanna go. Thanks for posting the vids. Enjoyed watching your ride. Brought back lots of memories from childhood vacations in that area. 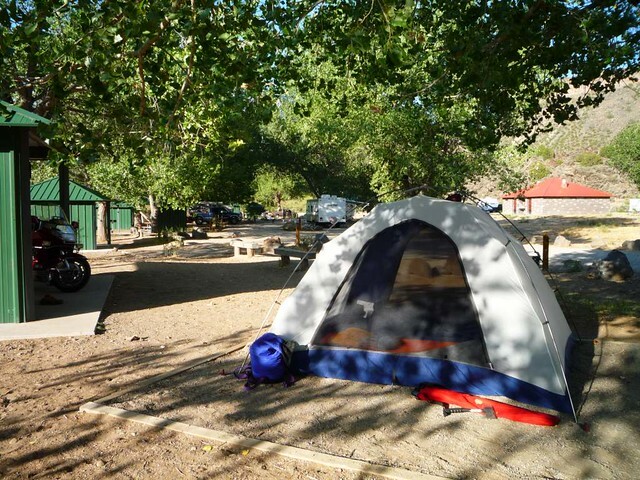 We camped in the Nat Forest near Tres Ritos several times. Never found Orilla Verde. Looks like a great find. Again, thanks for sharing. I stayed at this great little 'oasis' on Aug 12 2011 and loved the spot. Very well kept/clean and was a welcome relief from the 105* heat. Every campsite had a couple of nice shade trees. There are coin operated showers and flush toilets in the shower house and plenty of clean vault toilets throughout the campground. There is a picnic table in a covered shelter, BBQ grill, water and a fire ring at each campsite. 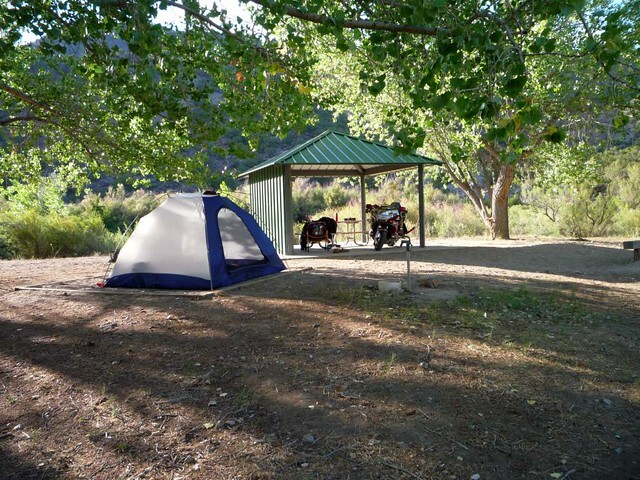 Nice quiet campground, with the Rio Grande running through the rear of the campsite. Couldn't be beat, especially for the price of $7/night. Highly recommended!! Stopped here one night in June 2013, I agree with everybody else, this is a great spot. It was pretty hot but the Rio Grande is just a few steps away, that snow melt is COLD. It will cool you down instantly. Camped here April 2015, I'd read the reviews posted here and decided to give it a try while in the area. It's a pretty nice place to camp, the fee of $7.00 is pretty sweet. There is not much available in Pilar so a trip to Taos is required if you find yourself in need of anything like good Beer. The bathhouse is clean, the pay showers work well, and the heated floors are nice when the mornings are cool. I camped a couple of night here and enjoyed my stay.